Sam Allardyce has been appointed England manager. The 61-year-old signed an initial two-year deal after compensation was agreed with Sunderland, whom he steered to Premier League safety last season. He succeeds Roy Hodgson, who quit after England were knocked out of Euro 2016 in the last 16 by Iceland. 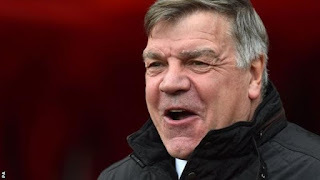 Allardyce, whose first game in charge will be a friendly at Wembley on 1 September against as yet unnamed opponents, said he was "honoured". He added: "It is no secret that this is the role I have always wanted. For me, it is absolutely the best job in English football. Football Association chief executive Martin Glenn said: "His excellent managerial credentials, including his ability to realise the potential of players and teams, develop a strong team ethos and embrace modern methods that enhance performance, made him the outstanding choice. "We could not help but be energised by his personal perspective on England's future." A statement on the FA's website said Allardyce's primary target is qualification for the 2018 World Cup in Russia, but he "is also charged with helping technical director Dan Ashworth integrate and strengthen the FA's elite performance and coaching programme across the England senior and development teams at St George's Park". Allardyce's first competitive match will be in Slovakia on 4 September as England begin their qualifying campaign for the 2018 World Cup. He leaves Sunderland after nine months, and the Black Cats are now looking for their ninth manager in eight years. A statement from the club read: "The focus of everyone at Sunderland AFC is on moving forward quickly and decisively, with the appointment of the club's new manager to be confirmed at the earliest opportunity." Allardyce, a former Bolton, Newcastle, Blackburn and West Ham boss, becomes the 14th permanent England manager. He has never won a major trophy but did win promotion to the Premier League with Bolton and West Ham.